We are the social media partner for Ravenheat Manufacturing, one of the UK’s leading independent boiler manufacturers. 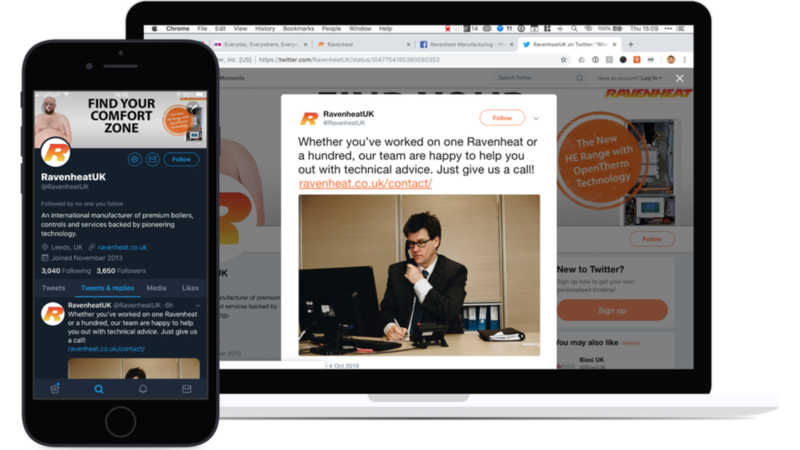 Working closely with the team at Ravenheat, we manage the company’s Twitter and Facebook channels, run social media campaigns and advise on strategy. We started working with Ravenheat back in early 2017 and helped establish a new approach to the company’s social media strategy. One of the key decisions was to look at how running a private Facebook Group could influence and support a separate group aimed at the public. The private group is specifically for installers – a key audience for Ravenheat as they are the people who fit and recommend their products. With more than 1600 members, the group has become a valuable support network for installers and a fantastic, direct communications route for the company. However, the group for installers provides another useful service. It’s a great place for sharing and testing content that can then feed into the public channel. Instead of creating double the content, the Ravenheat team are able to repurpose the private B2B material for its B2C audience, where it’s all about brand awareness. We write and produce content every week for both Ravenheat’s Facebook and Twitter channels. Whether we’re running competitions, highlighting specific products or creating paid ads, we are always looking for ways to engage the company’s growing number of followers. At the end of each month, we provide a detailed overview of how well Ravenheat’s social content has performed. That includes a report that goes directly to the company’s marketing team. This is an important part of the process, as it allows us to analyse, adapt and plan content for the following month.